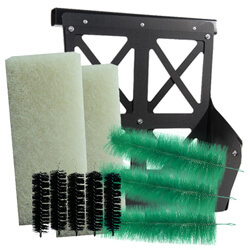 Skimmer Parts Find all skimmer pads, brushes, leaf nets and baskets, and all other replacement component for your skimmer here. The rubber door is specifically designed to fit over the water intake opening of Laguna's PowerFlo Skimmer Filter (PT1774). Used for overwintering purposes, the door provides a tight and secure fit to prevent unwanted material from entering the skimmer filter. Made of flexible yet durable rubber material, it is designed to withstand the cold winter months. Replacement Brush Panel for AquaScape MicroSkim. Includes frame for easy replacement. Easy to clean, reduces filter maintenance. Rigid-structure makes for easy cleaning. Pond Filtration is one of the most important components in maintaining a healthy and balanced ecosystem. Replacement brushes for use in the Ultra Skim Skimmer box manufactured by Aquascape. Debris Net for AquaScape MicroSkim. This net will trap leaves and other large debris before it can enter your pump. Skimmer net designed for use in the Grande Skimmer. 21" X 11" x 10" with a 16.5" opening in the front. Original factory replacement media for your Atlantic Skimmer. We recommend replacing the filter mat once a year in your skimmer for optimum performance. The Atlantic Skimmer Gate Keeper clips to weir door allowing leaves and debris to pass while restricting fish from entering the skimmer. Atlantic Water Garden Replacement Basket BS4000 for Model PS4000/4500 Atlantic Water Garden Skimmers. Skimmer replacement net / filter mat for Pondsweep of America. The Aquascape Replacement Nets for the SK700 & SK900 Pondsweep skimmers trap larger leaves and debris. The Filter Mat fits into the tray that sits vertically in the skimmer. Green Matala replacement filter mat cut to fit standard Savio SkimmerFilter. 2 Green Medium Density Matala filter mats included for the Savio Compact SkimmerFilter only. Genuine Savio Compact SkimmerFilter replacement components. The filter media is designed to provide both biological filtration and solid handling capabilities. The Savio Compact SkimmerFilter frame holds the compact skimmer mat for the Savio Compact SkimmerFilter unit. Replacement Filter Mat: Replacement Filter Media for Savio Skimmerfilter. Renew annually for best performance. Approximate Dimensions: 16" x 14" x 1"
Savio Basket: This Savio basket is designed as a replacement for the standard Savio skimmerfilter. Leaf baskets feature a rugged design and will help mechanically filter large surface debris. Installation and replacement takes just minutes. When used in conjunction with the standard Skimmer Net and Brush Panel, Matala Mat Kits create three-stage mechanical filtration that reduces maintenance and extends the time between skimmer cleaning. Mat Kits fit all pro Series Skimmers.